Under local anaesthetic, using lager volumes of dermal filler, an aged, hollow and "tired" appearance, can be re-sculptured to give back some of the lost volume of youth, reestablishing well being, strength and vitality to the face. 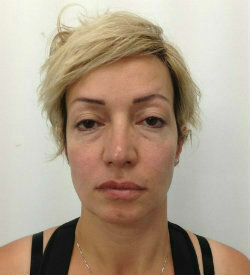 Here I have used dermal filler to re-instate mid face cheek volume. By giving back some of the lost volume of youth, the restored face has more vitality, looks stronger and and has a much greater sence of wellbeing. Gone are what I call the "negative curves" (the dips, hollows and troughs), to be replaced "positive curves" (typical of the flowing, smoother, fuller curves of youth). Note that attention has also been given to addressing some of the asymmetry of the face (the flatter [left side of photo] outer cheek). Nearly everyone has asymmetry, and often there is a small side and a large side to the face - our face is not a mirror image down the centre line. Often this asymmetry is boney and can not be changed. However, with tactful volume replacement, these asymmetries can be softened or blended to create or restore a natural look that is more "easier on the eye". See also under Fat Transfer for more on volume replacement. 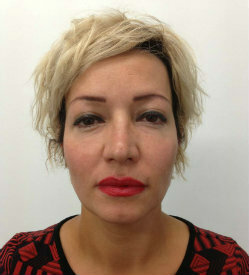 For more information on Dermal Fillers see under Dermal Fillers.